A rock garden would appear to present a paradox. 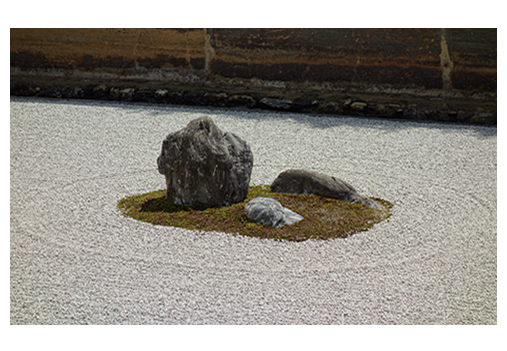 How can rocks, however artfully arranged, constitute a garden? Rocks are not living things, but living things make up a garden, do they not? These living things are plants, in a word, and they grow and change with the seasons. In a landscape garden they would likely be trees, shrubs, flowers, and grasses. But rocks are inert things. They cannot grow, nor can they change. At least, not on their own. 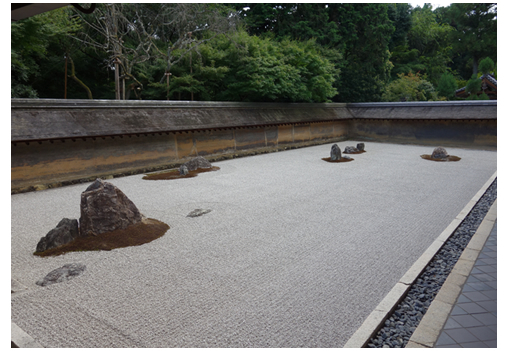 The rock garden of the Ryoanji temple appears to present this paradox more acutely than do most gardens of this kind. The garden is especially austere. It consists essentially of large rocks placed in a bed of gravel. The garden does contain one plant, however. This plant is a moss, and it surrounds the rocks. But the moss has only an ancillary, though not an entirely insignificant, role to play. No one would say that the garden is a moss garden. 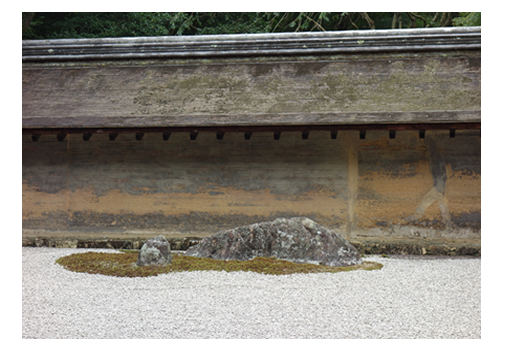 The Ryoanji garden is what we would today call minimalist. Not only does it have almost no plants, the garden is so austere as to be an all but barren landscape. It consists entirely in the three elements of rocks, gravel, and moss. The rocks are fifteen in number, and they vary in size. They are rather sparsely set out in clusters within a large field of gravel raked in parallel lines. The parallel lines are mostly straight though some are curved. The rocks form five clusters, and the clusters are bordered by the moss. There are by my count three clusters with three rocks and two clusters with two rocks. The clusters with three rocks are closer to the visitor, and the clusters with two farther away. The first cluster, which is on the far left, the middle cluster, which is third from the left, and the last cluster, which is fifth, contain three rocks each. The second and the fourth clusters each contain two rocks. The first cluster of three rocks, the one on the far left, has two accompanying rocks set a outside its moss border. These two rocks are the only ones in the garden without a moss border. They are much lower than the other three in the first cluster, and they barely rise above the bed of gravel. With surfaces not quite level they are among the smallest rocks in the garden. With a rake a gardener makes the gravel bed nearly level. He rakes only the parallel lines customary for rock gardens. The lines go primarily left and right and are parallel to the long edges closest to and farthest from the viewer. The gardener also rakes curved lines around the clusters of rock parallel to their borders. These lines extend out the width of the rake. We can see, too, lines raked parallel to the short ends of the garden on the left and the right. These lines are perpendicular to the predominant lines parallel to the long edges. They also are one rake in width. The garden has basically three colors. 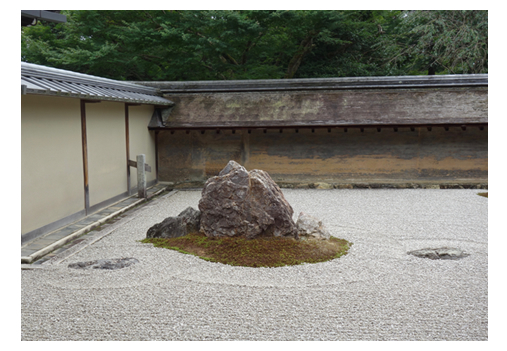 The rocks are a dark color, the gravel a light color, and the moss a color less austere. The rocks do have colors that differ, but their colors do not differ greatly. They do not offer enough variation to present a pattern or to allow any one rock to stand out. The gravel looks white at first glance, but a closer look reveals it to be white granite, apparently, with black flecks in it. The garden has around it a frame tidy and quite regular except for a portion of the near left side that juts out about a foot. The frame is of a white granite again flecked with black but at times slightly tinted with a pale yellow or even a light pink. The granite is cut into rectangular blocks and aligned to make what appears to be a rain channel around the garden. Past the far long side and past the right end of the garden is an earthen wall. Only with a conscious effort is one fully aware of it. This wall is made from a mixture of clay and rapeseed oil, the garden website informs us.2 It has protecting it a gabled roof covered with weathered wooden shingles and capped on its ridge with grey tiles. The veranda is also quite close to the garden. Because it is, it offers a vantage point so near that you cannot see the entire garden withn one field of vision. This fact makes the empty space appear even larger. The steps on the veranda invite one to sit on them and to view the garden from there. But sitting on the steps brings you yet closer to the garden and enhances the affect. Should you step back for a wider view, you would find your vision partially obscured by the residence hall construction. There are three posts supporting a roof over the veranda, and they will obstruct your view. Once you step back, you will likely find your vision also blocked by other visitors, and they can occasionally crowd the veranda though many stay for only a short while. The raked gravel augments the emptiness, and appears to extend it. The parallel lines raked to the left and to the right, those parallel to the long edges of the garden, are the occasion of this affect. Because they are parallel, they seem to extend the emptiness in our mind. The lines carry with them an implication that they continue beyond the garden and perhaps extend indefinitely past its ends. The lines raked parallel to the short ends on the left and the right define the ends and keep our vision within the garden. And yet they define the ends without undoing the inference in our mind of an indefinite empty space. They perhaps do so because the lines parallel to the sides are much longer, and, though they stop at the ends, they still carry an implication of continuing. There are also the curved lines raked around the rock clusters. These lines are parallel with each other but obviously not with the lines going left and right. Yet they do not interfere with the left and right lines and their implied space. The curved lines ripple gently outward and give an appearance more of participating within the space of the other lines than of conflicting with their space. The large rocks in the five clusters are not particularly unusual in their appearance. Their ordinariness is especially obvious if one compares them to scholar rocks. This fact suggests that we are not so much to contemplate the rocks separately but more to take them to be parts of an overall composition in the garden. It would suggest further that the rocks and their clusters might somehow be intrinsic to the emptiness of the garden. Indeed, the rock clusters do give an impression of enhancing the emptiness despite their obvious presence within it. Their presence does not so much detract from the emptiness as harmonize with it. If I wished to sound paradoxical, I would say that the rock clusters make of the emptiness an emptiness that is not empty. The emptiness is apparently one that can somehow assume a form. The clusters enhance the emptiness with their mere presence. The garden with the clusters offers a composition with a greater substance, shall we say, than it would otherwise have. Without the clusters the garden would present merely a barren field of gravel with lines that seemly go on to infinity. It would be little more than an abstract mathematical projection devoid not only of life but of its very possibility. The rock clusters especially enclose and draw our attention to the central emptiness. They do so because they are arrayed in triangles. These triangles draw our eye away from the clusters themselves and into the emptiness. They delineate more definite areas within the emptiness and yet unite the areas so defined. Two large triangles dominate. The one large triangle the third, the second, and the first clusters form, and the other the fifth, third, and first clusters form. Taken together the triangles lend substance to the emptiness. They mark off smaller spaces within the central emptiness and yet do not detract from the larger space implied by the parallel lines going left and right. The clusters are spaced sufficiently far apart so that their spaces do not interfere with the space formed by the lines. I would now draw the attention of my reader to the fact that, though it is static, the Ryoanji garden presents, perhaps not initially but eventually, an undeniable appearance of being dynamic. The garden is composed of rocks and gravel primarily, and, except for the moss, it is bereft of life. But the rocks in the garden do nonetheless yield a distinct impression of being alive. Though they are unmoving, at least to the human eye, the rocks yet seem to be moving and seem to be moving of their own accord. The rocks and their clusters most obviously yield an impression of upward motion. The clusters seem to be emerging out of the gravel bed. The three clusters with three rocks appear the most emergent. The tallest rock within each cluster rises to a noticeable peak, and its peak lifts the eye with it. Admittedly, the largest rock in the fifth cluster has a less prominent peak, but it has a peak nonetheless, and its closeness to the viewer adds to the affect. The two clusters with two rocks give a similar impression though less pronounced. One rock rises above the other in each cluster. But tallest rock in these clusters does not rise as high as the tallest in the clusters of three. Not quite even as high as the tallest rock in the fifth cluster. These lower heights have the affect of leading the eye away from these less emergent clusters in the background toward the foreground and the clusters more emergent. The clusters have an apparent motion that is rather serene. The rocks in each cluster present a stable configuration, and their configuration gives the rocks an appearance of moving upward together. The large and the small rocks within each cluster compose triangles balanced in height and width. These triangles lend the clusters a greater unity than they otherwise might have. The affect is that rocks appear to rise up together almost sedately. The tallest rock of all and the most dominant of all is the largest rock in the first cluster on the far left. It clearly rises above the tallest rocks in the other clusters, it has the most pronounced peak, and it is the largest rock with the most mass. This rock gives the appearance of having an upward motion with great impetus. It even seems to move powerfully enough to draw upward along with it the little rocks on its left and right. The tallest rock in the fifth cluster, which is on the far right, has an apparent upward motion stronger than it would have without the smaller rocks in its cluster. The smaller rocks are less emergent than the outlying rocks near the first cluster. But they do give an impression by contrast of a sharper peak and of a greater mass to the taller rock. They also form a triangle with the taller rock, and their triangle moves the eye upward. The third cluster may be the most curious of the three. The tallest rock within it has a blocky appearance. Its peak, though blunted, is yet noticeable. But it would seem to emerge abruptly because it is upright and its sides are nearly vertical. The two lesser rocks also seem emergent. They slope upward ever so slightly toward the larger rock, and they appear to rise with a slow motion tied to it. The taller rocks in the two clusters with two rocks are less prominent. The highest rock in the second cluster does not have a very pronounced peak. It is massive and elongated, but its ridge has sides sloping gently upward to its more modest peak. The affect is that the cluster appears to have less momentum. Hence, it deflects our attention back again to the clusters more emergent. The fourth cluster, too, seems less emergent, and it also takes our attention back to the more emergent clusters. The tallest rock in this cluster looks as though it has been sliced off, and its accompanying rock is more massive. But this rock has sides that are quite vertical, and these sides suggest that it, too, is being thrust abruptly out of the ground from below. With its accompanying rock the taller rock in this cluster also forms an implicit triangle again suggesting an upward motion. But we ought not to overlook the moss. The moss surrounding all the clusters rises above the gravel bed. Within each cluster it slopes slightly upward toward the rocks. This upward sloping adds to the illusion of upward motion. It gives the appearance that the ground around the rocks is rising up with them, and perhaps that the rocks have more mass hidden below the surface. There are also the rings raked around the edge of the moss and following its contour. They give an illusion of moving outward from the clusters as ripples might spread out from a disturbance on the surface of a pond. This outward movement complements the impression of movement upward. This illusory upward motion of the clusters has given rise to many metaphors offered for the interpretation of the garden. Perhaps the most pleasing metaphors are those that imagine the garden to be a landscape, and the rock clusters to be mountains rising above clouds or rising out of a dense fog. Or even to be mountains arising out of an ocean depth from its floor. These geological metaphors further suggest a psychological one. The emergent rocks might appear to represent the unperturbed minds of enlightened individuals arising out of and becoming indifferent to the shifting illusions of appearance. Indeed, some persons see in the five rock clusters the five mountains of the traditional Zen schools. There is no apparent downward motion of the rocks and their clusters, I might note. No one, as far as I know, has suggested that there might be. There would on occasion, however, be a downward motion of rain or snow or flower petals or leaves falling into the garden from outside. Their motion might by contrast heighten the impression of upward motion in the composition. But the Ryoanji garden yields yet another impression of motion. This impression is of sideward motion. A visitor on the residence veranda, even during a short visit, cannot help but realize eventually that the central emptiness in the garden is off center to the left. He or she on a longer visit would soon realize that the emptiness actually appears to shift to the left because the rock clusters seem to be moving in a leftward direction. The clusters on the left seem to have gone past the viewer, and the clusters on the right seem to approach the viewer. If you were to view the garden from the very left end of the veranda, especially from its lowest step, you would see that the rocks closest to you appear to be very large. They seem to be approaching toward you from the right end of the garden. The more distant rocks on the right appear appreciably smaller, and they seem to follow these that are closer. But if you view the garden from the very right end of the veranda on the lowest steps, even the rocks closest to you do not appear to be as large as those on the left. In the photograph the rocks on the left and the right might seem to be about the same size. But a return visit to the garden confirmed that we do perceive the rocks on the left to be noticeably larger than those on the right even from the right end of the veranda. Unfortunately, one cannot go further than the end of the steps on the right of the veranda. The veranda does not extend far enough to permit us to view the garden from the right end.6 But the garden website contains a photograph taken from the right end. This photo shows the rocks on the right appearing to recede toward a vanishing point at or near the largest rock in the cluster on the far left. This photograph makes the rocks on the right of the garden seem larger than those on the left. I suspect that this impression is, again, an artifact of the camera. But I cannot verify that it is. Indeed, the more massive rocks in the garden are those in the two clusters on the left, and the smaller rocks are in the three clusters on the right. This fact adds to our impression of leftward movement because it draws our eye leftward. The largest rock in the first cluster––the very largest of the entire garden––quickly becomes a focus of our attention. The tallest rocks within each cluster also have a triangular formation suggesting a leftward motion. In the first cluster the tallest rock not only appears to rise but also to move to the left because its right side inclines not only upward but leftward. This side is its longest side. The smaller rock on its right also has its upper side inclining to the left. 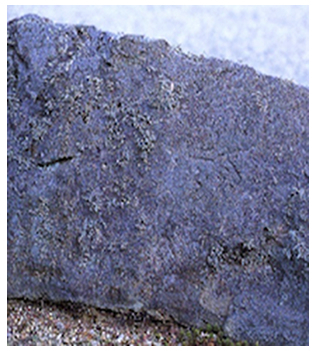 The smaller rock on the left has only a short side inclining to the left. But its longest side slopes downward to the left. I would point out that all rocks within a cluster would appear move forward together much as they move together upward. Within each cluster the rocks exhibit an apparent lateral motion, but they also retain their configuration within their cluster. This stable configuration lends a unity to the lateral motion. The affect is one of an illusory motion that is quietly subtle and, again, almost sedate. One might note, too, that the largest rock within each cluster has an elliptical or oblong base. 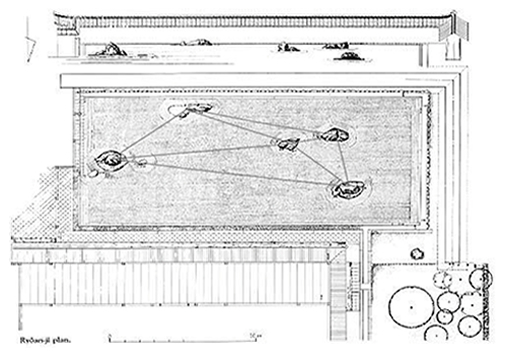 These elliptical bases are parallel to the long raked lines in the gravel and to the long sides of the garden. This shape discourages the eye from moving past them and away from the viewer, and it gently prods us to turn our gaze to the left. The clusters taken together also present an arrangement further implying a leftward motion. The first cluster is the closest to its end of the garden. One small rock accompanying the largest rock all but bumps up against the end. The last two clusters, the fourth and the fifth, are the farthest from their end of the garden on the right. This arrangement, shifted again toward the left, makes the clusters seem move through the gravel bed on toward the left and away from the right. The second cluster appears to be moving toward, if not attempting to catch up with, the first. This cluster is closer to the first than it is to the others. The third cluster seems to lead the last two clusters leftward. This cluster is farthest advanced of the three on the right, and it is the closest to the second cluster. The other two seem to follow it. They are closer to it than they are to their end of the garden. The tallest rock in the first and the third clusters, because they are the tallest, give a further appearance of leading the rock clusters in their leftward motion. The tallest rock in the first cluster leads the entire ensemble, and the tallest in the third cluster leads the ensemble of the last clusters. Consider again the fact that the rock clusters form triangles in the gravel field. These triangles not only define the emptiness near the garden center, but they also enhance the illusion of lateral motion in the garden. The large triangle formed by the third, second, and first cluster and the large triangle formed by the fifth, the third, and the first cluster taken together form a arrowhead, as it were, pointing leftward. The two smaller triangles on the right again draw our attention to the larger ones. These triangles the fourth, third, and second cluster, and the fourth, third, and fifth cluster make up. They share a side in common, and they share their left sides with the two larger triangles. That they share their left sides with the larger triangles seems to join them with the larger ones and to allow them to lend the leftward motion an impetus. The moss surrounding the rock clusters primarily augments their upward movement. But the moss surrounding the clusters on the left would also appear to augment their lateral motion. The first cluster seems to outrun its moss and to leave the moss behind in its wake. The small rock in the front of the cluster pushes through to the very edge of the moss, and the moss behind the small rock at the end of the cluster would seems to trail along. The moss surrounding the second cluster seems to be pushed forward and off to the side toward the first cluster by its rocks. It appears to be pushed with the cluster as if it were more cohesive and offering more resistance to its motion. The resultant oblong shape is expanded considerably and assists with the illusion of lateral motion. The moss surrounding the clusters on the right is more symmetrical as if the clusters have yet to gain no more than a little leftward momentum. But the fourth cluster has a more oblong border, and its border suggests more lateral motion than do the circular forms of the third and fifth clusters. The large rock in the fourth cluster seems about to break through the moss on the left. The irregular frame in lower left corner hints that the garden with its apparent motion might extend beyond its immediate boundaries. It appears to give the clusters with their sideward motion an outlet through which they might flow out of the garden as a stream might flow out. Without this outlet the first cluster would seem to have a motion that would lead it to crash into the left edge of the garden and pile up in a heap. The other clusters behind it might soon suffer a similar fate. The inclination of the second cluster toward the first and the shape of its moss fringe imply a modest counterclockwise motion toward the irregular corner as well. But the inclination of the fifth cluster toward the first suggests a contravening, though less forceful, eddy in a clockwise direction. The illusory flow leftward is thus more a natural one with a large, slow, eddies than a simple flow mathematical and rectilinear. This illusory lateral motion has given rise to another metaphor. It is that of tigresses swimming in a river with their cubs. The more oblong rocks, especially of the second and the fourth cluster and perhaps fifth, do suggest the back of an animal swimming in a river. Some people say that the tigresses are swimming across a river. Perhaps they are. But they appear more, I would think, to be swimming with the current, possibly crossing the river. This animal metaphor also has its psychological implications. It suggests an enlightened mind enduring in the river of time. We must somehow manage to maintain ourselves despite the vicissitudes of change. As a tigress would preserve herself and her cubs while swimming in a river, so must we maintain ourselves while we are subject to an endless stream of illusion. The garden presents no impression of motion to the right. The only possible exception to this assertion, I think, would be the fourth cluster. The rock on the right in this cluster is higher, and its right side might appear to extend to the right. But its top slopes to the left, and its grain inclines leftward. Its massive accompanying rock also more than counterbalances any rightward motion and draws our eye leftward. Nor is there any movement to or away from the observer. The more distant second and fourth clusters do have the affect of causing the eye to flow back to the closer first, third, and fifth clusters with three rocks. But the oblong shapes of the second and fourth clusters arrest any hint of apparent motion in the rock clusters themselves to or away from the viewer. Not to mention the long parallel lines raked in the gravel. The entire composition is very peaceful. The garden surely exhibits a balance in its static and dynamic affects. Or perhaps I should say that the garden presents a balance between its impressions of motionlessness and motion. To speak paradoxically, it would appear to present the viewer with an overwhelming impression of unmoving motion. The garden is unmoving, and yet it is seemingly moving. We can also see a harmony, too, in the upward and sideward motions. All the rocks within their clusters move together both upwards and leftwards, and all the clusters together would seem to move in both ways. The clusters form triangles in harmony each with itself and with each other. Indeed, the large and small triangles fit together in a way lends balance to the garden space. The harmony of motion and rest and of upward and sideward motion would actually appear to constitute a paradigm of the universe. Does not the universe exhibit both motion and rest? Does it not exhibit upward and, admittedly, downward motion? And does not the universe move forward, at least metaphorically, through time? This harmony seems a paradigm for our own nature as well. We are continuously in motion and at rest, are we not? We are the same, and yet we are not the same. We have an identity, but change and move forward through time, and we come to be and eventually we cease to be. 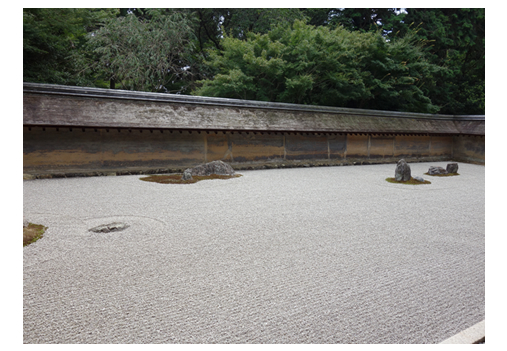 I would now argue, and not without some trepidation, that the Ryoanji garden is metaphysical. Forgive me for using a word much abused today and not only by philosophers. I shall argue that the garden is metaphysical in a straightforward, but profound, sense of the word. Or perhaps one might better say that the garden presents us with an ontology at once discomforting and yet comforting. Almost all visitors to the garden become hushed when they step out onto the veranda. The garden somehow takes us out of our ordinary way of seeing things even on our first visit. Or, rather, it can do so if we can open our minds up to it. When visiting, one occasionally encounters tour guides with their groups, thankfully small, and their rather facile explanations of the garden design. Unfortunately, their explanations, because usually preconceived, can hinder one from seeing the garden for what it truly is. The tour guides exhibit a foible all too human. Language can too easily fix our thoughts and ensconce us within a comfortable illusion. Even if we do not succumb to a preconceived explanation, our linguistic habits can nonetheless harbor conventional notions, and these notions can prevent us from opening up to the garden. Indeed, our notions can keep us from grasping the reality even of our everyday world. We harbor an unfortunate predilection to take what things merely appear to be, to be what things really are. 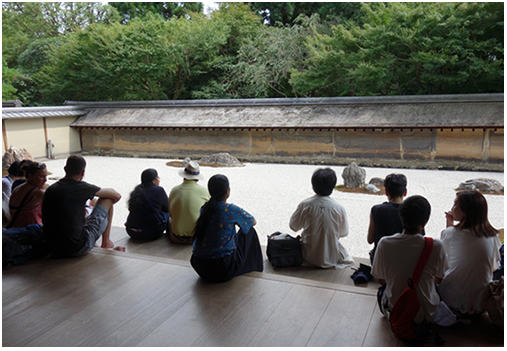 The Ryoanji garden can awaken us out of the comfortable notions foisted upon us by our mental and verbal habits. One unfortunate notion of this sort is that a thing has a substance. A substance, we like to think, is an entity that endures unchanging through change. A rock remains a rock, we have a natural tendency to believe, even though it might tumble down a hillside, and even though it might break into pieces at the bottom. The garden shows us that this notion, however convenient it may be, is but an illusion. The rocks in the garden obviously appear to be substances. They surely give an impression both of not changing and yet of changing. We have seen already that the rocks would seem to be in motion, ever so subtly, both upward and sideward. But we have also seen that this motion is illusory. The rocks have not moved, or been moved, in centuries. If we reflect for a moment, we cannot but come to the realization that the rocks exhibit an illusory motion entailing the discomforting implication that all motion is illusion. Our perception of motion is in truth no more than a mental projection. At any single moment no thing can ever possess motion. Only if we recall in memory a past moment or call up in imagination a future moment, does an object perceived in a present moment seem to possess motion. A thing could move, if move it could, only from one moment to another. If we continue with our reflection, we soon arrive at the further realization, no less discomforting, that the garden presents us with substances that are illusory, too. The garden intimates that its very rocks are no more real than their motion. Though we like to think that they remain unchanging, we cannot deny that substances do indeed change. They come into existence and go out of existence. Animals are born and they die, and plants sprout up and whither away. Even minerals are generated and annihilated. Obviously, rocks are among those things that come into existence and go out of existence. They arise out of geological processes of all but unfathomable pressures and temperatures, and they will eventually succumb to these very same processes. Not to mention the cosmological forces that can create and destroy planets and stars. Nay, these forces can create and destroy solar systems and galaxies. The rocks of the garden, too, have come into existence and eventually will go out of existence. They are even now wearing away ever so slowly though we cannot perceive their changes. Only a trace of their changes is evident. I understand that the largest rock in the second cluster bears an inscription. But one character of the inscription has already been partially effaced by the elements. The Ryoanji website includes a photograph of the inscription though it is barely discernable to someone unaccustomed to kanji. These changes, seemingly so real, are also mental projections. We must conceive of a moment before the present or of a moment after the present if we are to conceive of any object coming into existence or going out of existence in the present moment. But these concepts of an earlier moment and a later moment are surely no more than hypotheses on our part. Any geological moment, imperceptible and almost inconceivable, is but a conjecture. A cosmological moment is a rather tenuous speculation. That substances might come to be or cease to be is, then, an illusion. Only if we think of a past moment, or if we think of a future moment, do we think that a substance enters into or exists from existence by changing from a moment in the past to the present or from the present to a moment in the future. We can only imagine, because we cannot recall, the inscription on the rock before it was effaced though we could now see the effaced inscription––if we were permitted to enter the garden. I now cannot but ask, What is left of substance? That a substance might not change can only be an illusion, too. How can we perceive a substance to be unchanged without remembering a moment in the past or imagining a moment in the future? There can no more be changelessness in a single moment than there can be change. Or, in other words, motionlessness as well as motion can be but a mere illusion. What we take to be a substance, then, presents us with a double illusion. A substance might seem to change, but its changing is a mental projection of ours. A substance might seem not to change, but its not changing is our mental projection as well. What, then, is real? one might wonder. We now find ourselves coming face to face with a brute metaphysical fact. Nothing is real! Any reality would appear to be a substrate underlying our illusory substances with their illusory motions. But a substrate can only be an empty nothing. It is nothing, one might better say, except, perhaps paradoxically, mere existence itself. A substrate would be nothing because we can neither conceive it nor perceive it to be something. We may conceive a substrate to be only what is all but inconceivable. A substrate we may conceive to be, I would venture to assert, only what is not something. When we conceive anything, we conceive something to be something, do we not? But nothing we cannot conceive to be anything except its bare, naked, self. Because it is nothing, a substrate would be quite formless and bereft of both motion and rest. One cannot project onto it a before or an after except an empty before and after. There is nothing from which it might change, and there is nothing into which it might change. Or, one might perhaps say, it could change only from nothing into nothing. But what can change from nothing to nothing? Not even nothing. We have discovered, then, a metaphysical metaphor hidden away within our garden. 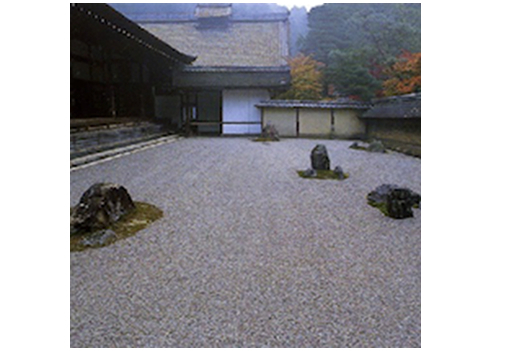 The garden exhibits a nothingness very similar to the emptiness at its center. The emptiness in the garden is not empty. Its emptiness the rock clusters delineate and define for us with various smaller spaces. The clusters form larger and smaller triangles that divide up and mark off areas within the emptiness. Without the clusters the space would be a sheer void. Ah, we cannot neglect the moss. The moss would seem to grant us a respite from our metaphysical malaise. And perhaps it does. The moss brings us out of our disconcerting reflections and back to an ordinary reality. It is a plant, and it is alive, and it changes with the seasons. It brings to mind the cycles of the seasons and of life and death. It might even call to mind ecological cycles and ages. The moss reminds us, too, that the garden does not exist in isolation. There are other plants visible outside the garden, and they would appear to interact with it. There are the trees outside the garden wall with branches hanging over the edge of the garden. Their leaves bud, grow, and eventually change color and fall into the garden. They also blossom in due season, and their flowers drop petals into the garden. I almost overlooked the garden wall itself. It, too, appears to change ever so slowly. After centuries the mixture of clay and oil now presents different patterns, and these patterns in turn are suggestive of various landscapes. And there is the weather, of course. The sun, sky, and clouds are present, and at times it rains and even snows. Not to mention the many visitors on the veranda with their comings and goings. But our respite from our metaphysical travails is all too brief. It can last only for a fleeting, unreflective, moment, I dare say. These changes, too, cannot but be illusions. Perhaps because we more easily take them for real, these changes seem to present a counterpoint to the illusory rocks and their illusory motions. But these intrusions into the garden can only underscore the illusory nature of all motion and rest. These intrusions are and can only be our projections. I would be remiss should I not point out that we ourselves are to be numbered among the objects of illusion. We are beings, are we not, who appear to have a substance and who appear to change and to move about. But our changes and our actions must also be illusions. Only by taking cognizance of a before and an after can we be aware that we are changing or acting. At any one moment we are without change or action. Our change resides, again, in our minds only. Any change is a projection of our mind, either conscious or unconscious. And so it is with our very existence. Our existence is an illusion, too. Only if we could endure from one moment to another moment could we be a substance. But we can have neither past nor future except within our mind. Hence, we do not and cannot endure. We are but nothing. We may think that we can see someone grow and age from infancy to senility. But we do not. We simply project a change with our memory or our imagination. Indeed, if we could move, and we cannot, we would have nowhere and nowhen to go. If we could exist, and we cannot, we would also exist nowhere and nowhen. Or, rather, we are nowhere and nowhen, and we can neither come nor go anywhere or anywhen. We are, after all is said and done, if I may so speak, nothing other than an illusion shimmering, anxiously perhaps, on the surface of a substrate that is nothing at all! 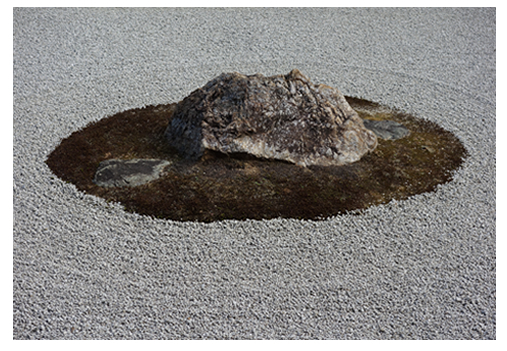 Whoever designed the Ryoanji garden, then, placed within it a metaphysical precipice.12 A rock is not alive, and living thing is not a rock. But both a rock and a living thing are curiously similar. The rocks in the garden would seem to be alive and to move. But their motion is an illusion. We would more obviously seem to be alive and to move. But our motion, too, is an illusion. What is real can only be nothing. But nothing can be neither alive nor not alive. It is neither in motion nor not in motion. We surely owe a debt of gratitude to those who designed the garden both for the garden itself and for its insights. My fear is that my interpretation may not measure up to their intention. If I am right, these humble gardeners present us less with a paradox than with a paradigm––a paradigm for our very life. As life in their garden is an illusion, and so is our life. And yet our life, though an illusion, can be a thing of tranquility and harmony and of beauty and sublimity perhaps. The garden surely is, and our life surely can be should we but wish it. 1 Actually, the moss can change color within a single day. A rain shower passed over the garden when I was last visiting in August. A half hour or so after the shower the moss around the clusters changed from reddish brown to green. It did not turn entirely green, but it did turn about half green. Then an hour or two later the moss reverted back to its late summer brown. 3 Try as I may, I cannot quite capture with my camera the emptiness in its entirety, nor can I find a photograph that does. I had in fact to take this photo from a position on the veranda a little more to the left than would be best for viewing it. 4 On this diagram I have drawn in the lines between the rock clusters to indicate the two large and the two small triangles formed by the clusters. Slawson would appear to attribute the diagram to Mirei Shigemori (Teachings, chap. 3, p. 96). I discovered it in an electronic format on Pinterest and have not been able to trace it back to its original source. 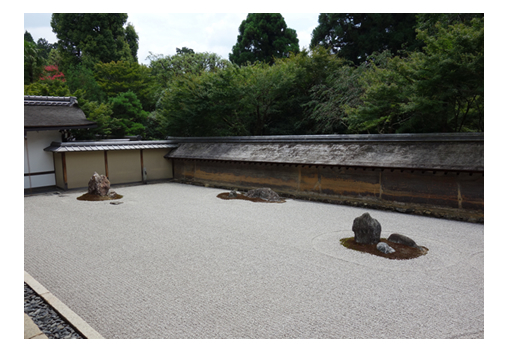 5 Slawson presents an interesting analysis, based on historic sources, of how triangles function in Japanese gardens and of how important they are for implying motion as well as stability (Teachings, chap. 3., esp. pp. 89-106). A symmetrical triangle, resting on its base, has, he argues, a stable equilibrium (p. 98). But it also implies, partly because of its firm base, a vertical motion toward its point. This he calls the arrow effect (pp. 99-100). 6 Slawson informs us that there was once a walkway that continued from the present veranda around to the right end of the garden (Teachings, chap. 3. pp. 100-101)! 7 Slawson presents an informative diagram with vectors to show how a triangle, lying on a side, can imply lateral motion. The implied motion arises from the sum of a diagonal vector on its top side and a horizontal vector along its bottom side (Teachings, chap. 3, p. 101, fig. 32). 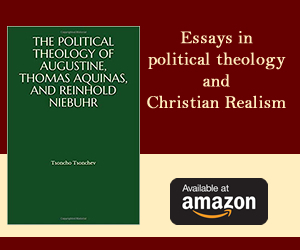 Yet he is of the opinion that the first cluster and the second have formations that imply “a subtle yet unmistakable rightward thrust” (Teachings, chap. 3, p. 95). But his vector diagram would appear to be applicable and to show that the implied movement is actually leftward. The first cluster and the second both have compositional forms with vectors suggesting a leftward as well as an upward thrust. He does agree that the third, fourth, and fifth clusters have overall a leftward thrust. This thrust he takes to counteract the thrust of the first two clusters (p. 95). 8 Slawson mentions only one instance of what he calls the arrow effect in the cluster arrangement. He agrees that the fifth, fourth, and third clusters form a triangle, but this triangle, he claims, only points to the second cluster (Teachings, chap. 3, pp. 100-101 and pl. 19). He does not take notice of the arrow effects of the larger triangles formed by third, second, and first clusters and by the fifth, third, and first clusters. Nor does he notice the arrow effect of the fourth, third, and second cluster. I think that Kerr perhaps best captures the general quality of the cluster arrangement in the garden when he states that they make up what he calls a scattering. 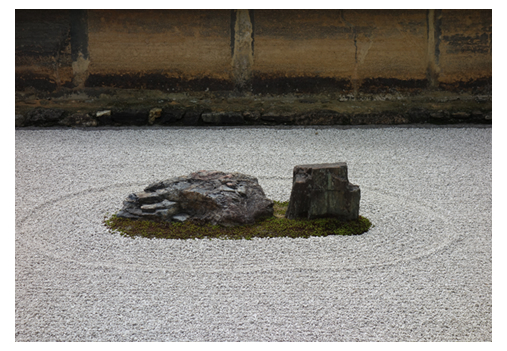 A gardener, or any artist, creates a scattering by eschewing the “rules of order” and by putting objects together in an arrangement “more or less at random.” And yet, he continues, the resultant arrangement somehow feels “just right” (Kyoto, chap. 8, pp. 281-283). One can surely agree that the rock placement in the garden lacks a formal pattern and has a random element. The clusters probably could not be successfully placed in an ordered formation. To do so would be to spoil the aesthetic affect. A more formal arrangement would likely be so static that it would detract from the dynamic illusion of motion. But the rocks do clearly have a placement, though not formal, with this affect in mind. Another arrangement, more or less random, could also occasion illusory motion of a similar sort, I would think. 9 Quoting Zen sources, Parkes agrees though only in general terms. He asserts that the garden permits us to see how things have a suchness at one with nothingness (Reading, pp. 135-136). 10 The concept of a scattering is applicable in this metaphysical context as well (Kerr, Kyoto, chap. 8, pp. 281-283). A formal arrangement of the rocks and their clusters might very well focus our attention on its formal somethingness and stimulate our customary habits of language and thought. An arrangement of this kind could thus hinder us from experiencing and enjoying its existential nothingness. 11 Parkes rightly remarks, quoting again, that we not mere spectators, but we become part of the garden and its expression of enlightenment (Reading, pp. 135-136). 12 No one can say with certainty who designed the garden. But Berthier argues rather cogently that two gardeners named Kotaro and Hikojiro would be the mostly likely candidates. The inscription on the second cluster appears to be their signature (Reading, pp. 47-58). Berthier, François. Reading Zen in the Rocks. Parkes, Graham, trans. Chicago: The University of Chicago Press, 2000. Kerr, Alex. Another Kyoto. With Kathy Arlyn Sokol. Tokyo: Sekaibunka Publishing, Inc., 2016. Slawson, David A. Secret Teachings in the Art of Japanese Gardens. New York: Kodansha International, 1987.